I guess I had better post the 3rd project from club this month. 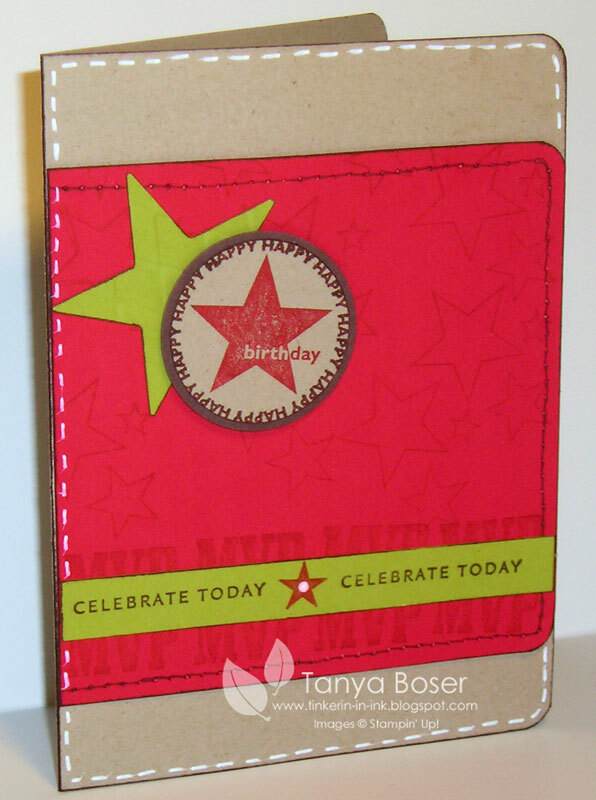 We made a card featuring the new Presto designer series paper and the Itty Bitty bits stuff. 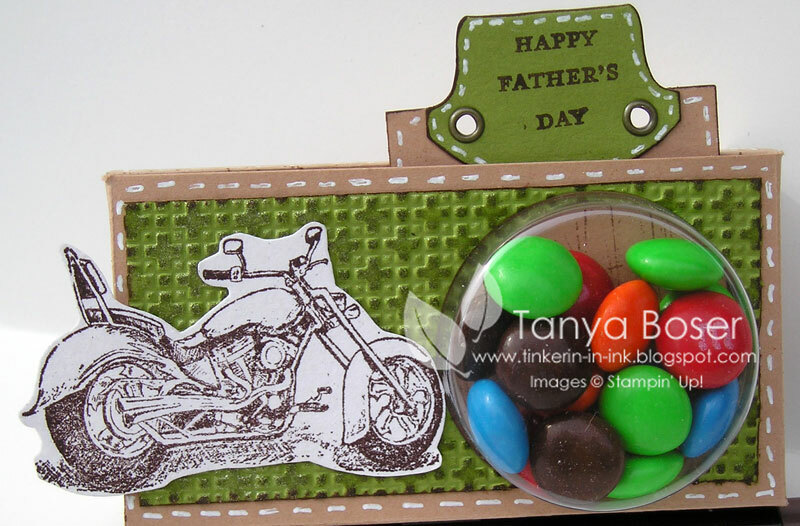 Love those tiny little buttons and coordinating punches and stamps! So this is what we made! The phrase on the front was just what was handy on my stamping desk, but you could put anything there. 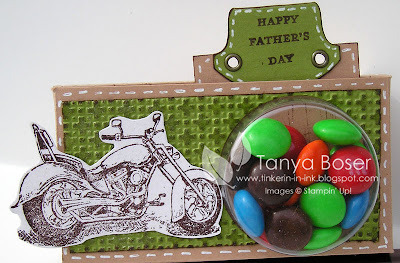 Maybe I was thinking of my hubby when I was making the card, I mean he has been out of town working alot, lol! 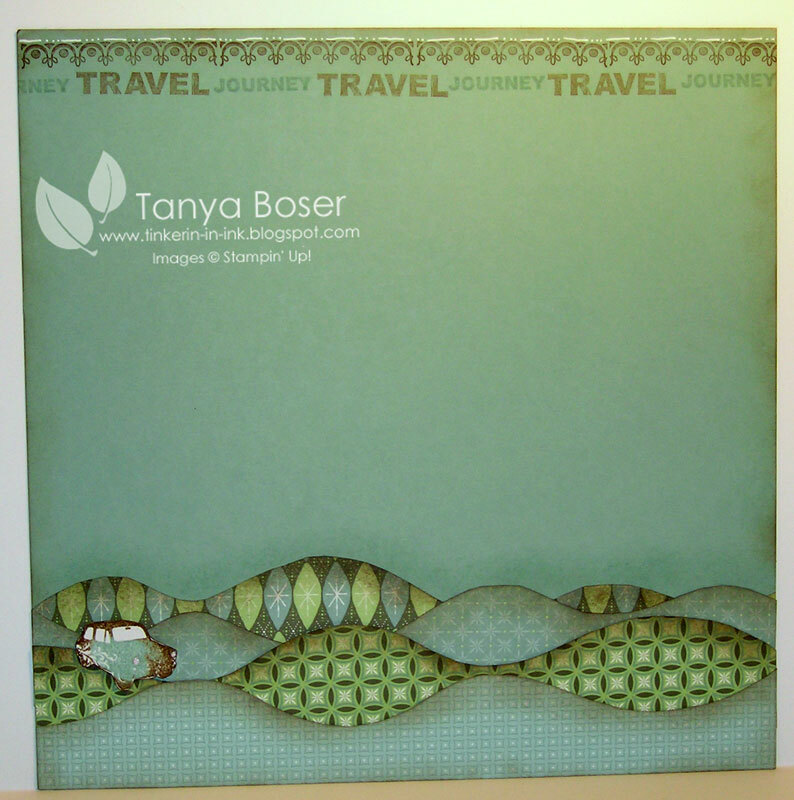 The Presto paper is white 12x12 heavy card stock with white embossed images on it already. You can then do all kinds of resist techniques on it! Here we just took 1" x1.5" pieces of the Presto paper with a script image, then rubbed an inked sponge on each piece and wiped the excess ink off the embossed part. Quick, easy, and gorgeous! 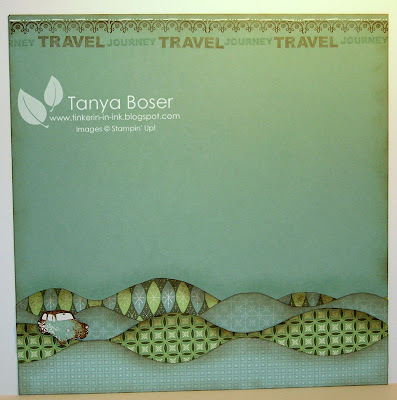 I stapled the ribbon on then mounted the inked Presto block with Stampin Dimensionals. This is the card I made for my youngest son's 14th birthday. Of course, I made it ON his birthday, being the good little procrastinator that I am, lol! Come to think of it, I think I used the same set for Dakota's card this year. Uh oh, I better start mixing it up better! 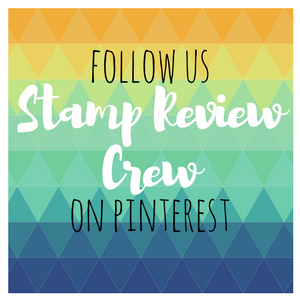 I made this during our All-Day Stampin Fun event on May 1st. And we did have fun! I did learn one thing though. I will do this at MY house next time so I don't have to haul all my stuff a few miles away for everyone to use. 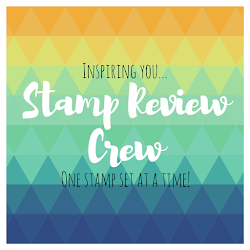 My stamping space is in the great room upstairs, which I kindly share with the rest of the family, lol... Ok, now back to the card! I just had to throw a close up of the car in here. 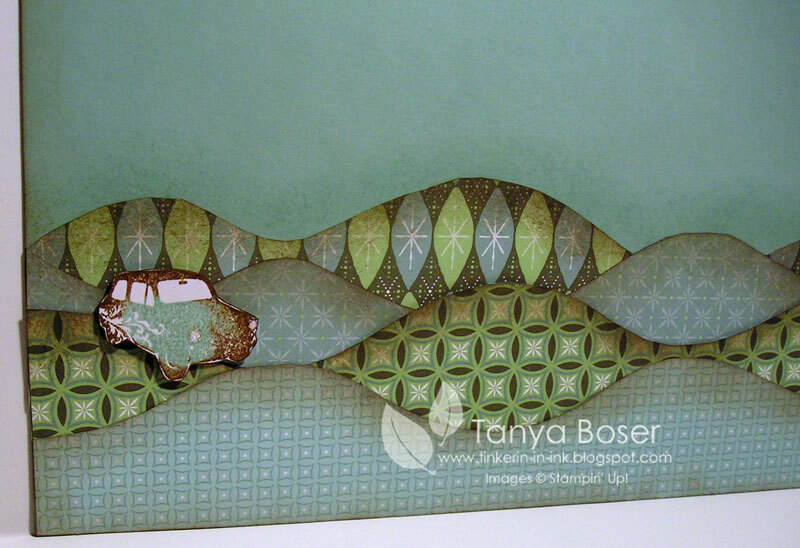 I used the Rock and Roll technique on this little car to try to make it match the Shabby Chic feel of this page. This is the 3D project we will be making. 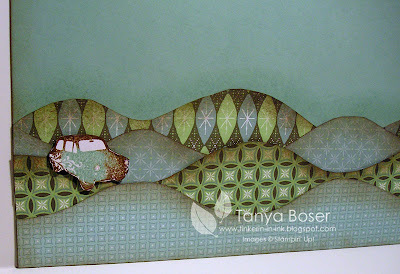 I featured this on my Blog Hop, and now you will all get to make your very own! 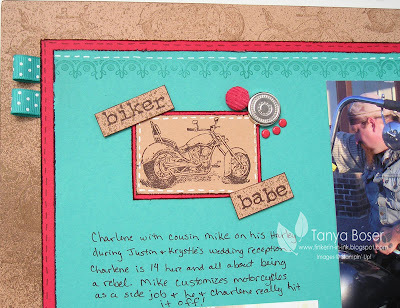 My scrapbook page seemed to be the favorite project for my Blog Hop entry! I am so glad everyone else loved it as much as I do :) I thought you might like a closer look at the details, so here you go! And part 2 of the page title. You can actually read the journaling here too. 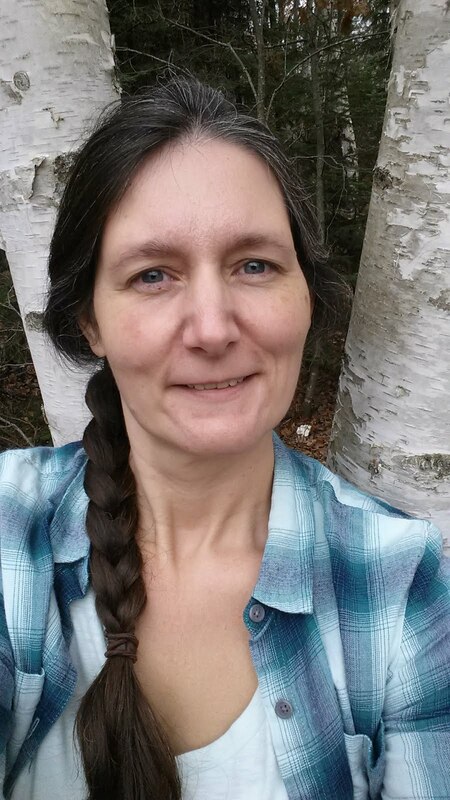 I am turning over a new leaf in the last few months. I WILL use my embellishments before they retire, I WILL NOT hoard them forever, lol! 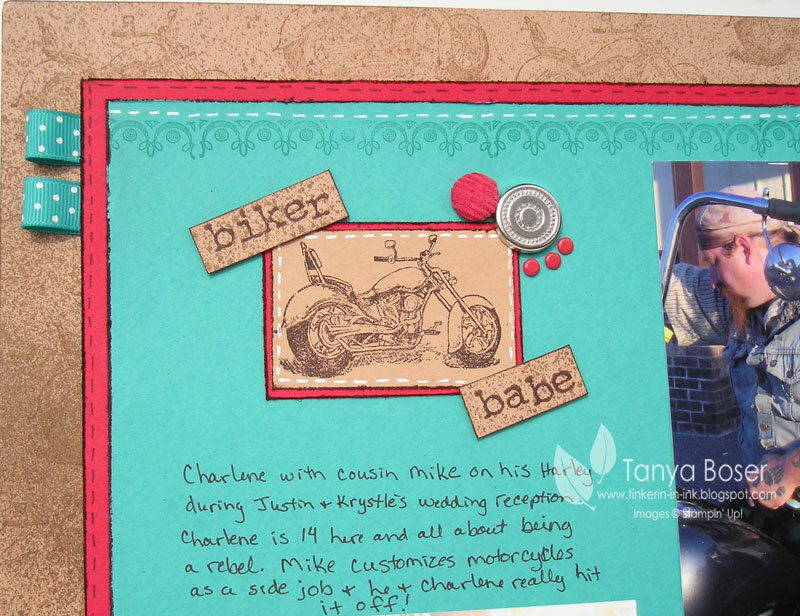 OK, the Real Red Corduroy buttons are not available anymore as of this weekend when the Occasions Mini ended, but in my defense, I did make this page before they retired ;) I love how the Circle Designer brads go with the wheels theme. And I mentioned that there is a special this month, well here is the list of qualifying stamp sets that will earn you some of these great brads! Ok, you caught me slacking again! I haven't posted the card and the 3D projects we made last month yet, so here they are! This is the card we made, although the designer paper is different. I ran out of Razzleberry Lemonade paper when I had to make extra cards after the club meeting, so this is the retired Juntos Designer Series paper from the 2008-09 Spanish SU Idea Book & Catalog. 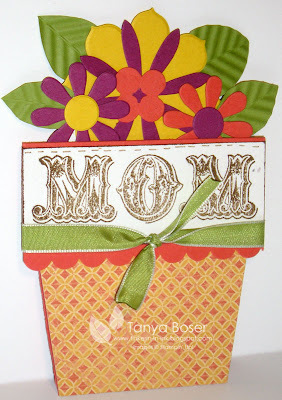 This flower pot card idea can be found all over the crafting sites and is really easy to make. 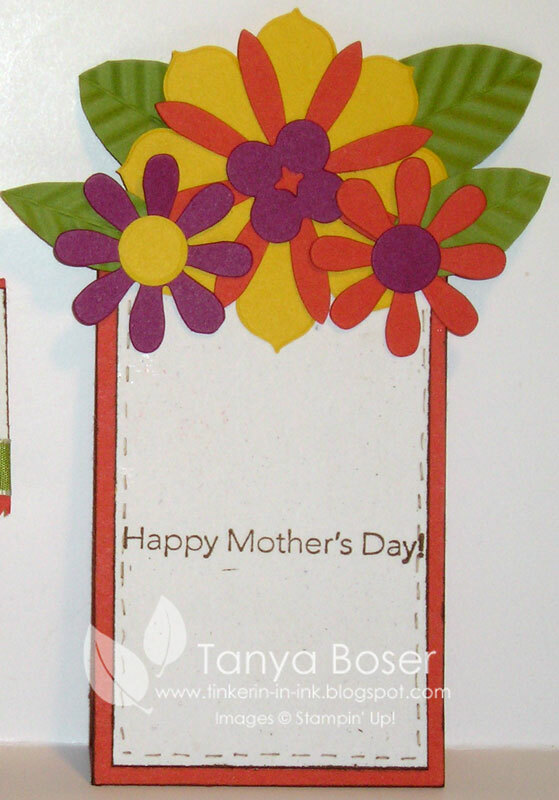 Start with a 3 1/2" x 9" card base scored at 5 1/2" and 2" and go from there! I used the paper cutter to make the tapered sides by lining up the top corner under the pot lip in the cutting groove and the bottom corner on the 1/2" line to the right of the blade. I applied the DSP first and cut through all the layers at once, then flipped the top layers up holding it in place, and cutting a second time to get through the last layer. 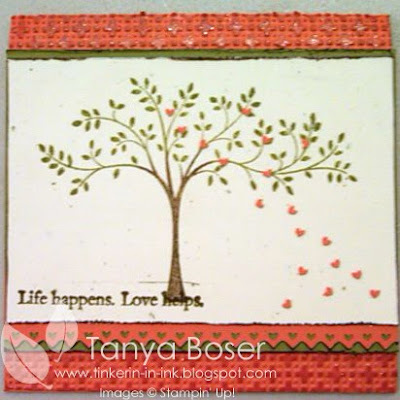 The leaves are made by taking a long strip of cardstock 3/4"-1" wide, scoring down the middle and running it at an angle through the paper crimper. While it is still folded, cut out your leaf shapes. Presto! Instant textured leaf! And this is the Matchbox that we made for holding a little something for Mom. 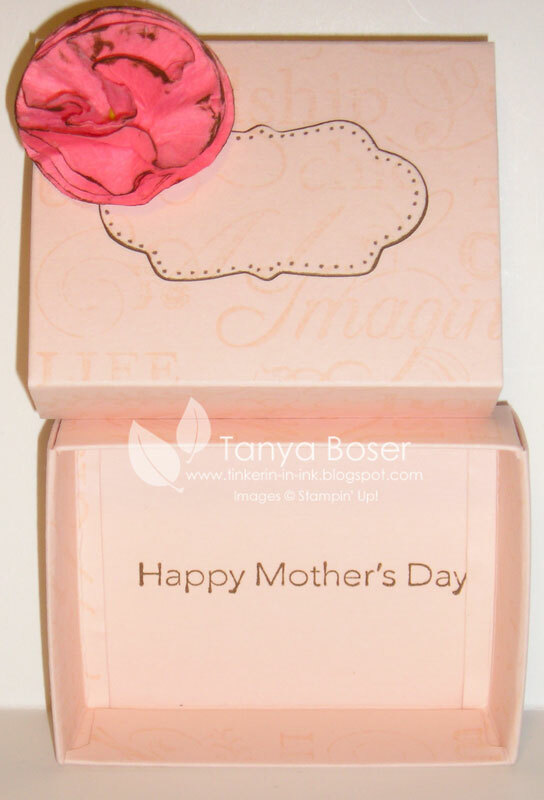 MAke sure you stamp your greeting before you fold your box up ;) The flower is created by taking 3 circles punched out of cardstock, roughing up until the paper starts to seperate into 2 layers, then peeling apart. Do this with all 3 circles. Pile on top of each other with the fuzzy sides all up, place on the mat pack foam pad, pierce through center. Then push a brad through the center and open the prongs on the back. Now pull each layer up individually around thr brad, scrunching up tight. Open back up until it looks like a flower. You can then color the edges of the petals with a marker.